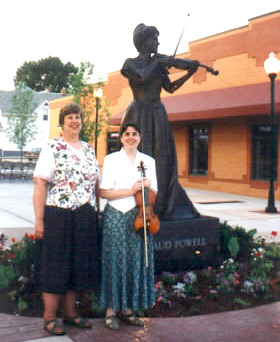 An 8-foot bronze statue of Maud Powell stands proudly in the town center of Peru, Illinois, the city of her birth. 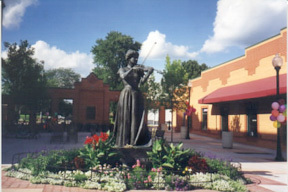 A lasting memorial to the great violinist, it is the only statue to an American woman musician in the United States. The impressive statue was beautifully sculpted by Joseph Heyd, O.S.B. A commemorative plaque describes Powell's achievements and her affection for the citizens of Peru. 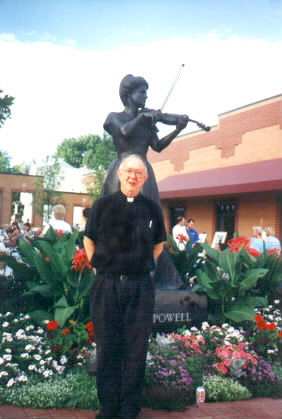 Dedicated on July 1, 1995, the statue is located next to City Hall in East Plaza at Fourth and Putnam streets. Powell biographer Karen Shaffer was invited to speak at the dedication ceremony and as part ofthe festivities gave a lecture/slide presentationon Maud Powell. 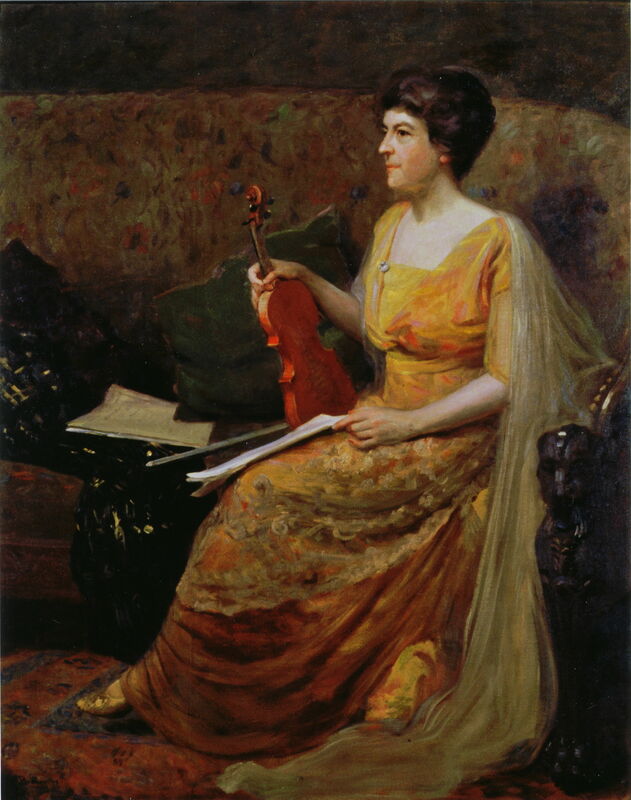 Louise Schroader presented the play Maud Powell and Elizabeth Reed Smith, violin, and Kay Wildman, piano, performed a recital of Powell's transcriptions and music dedicated to her. 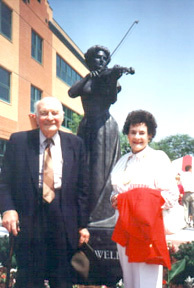 Sculptor Joseph Heyd (left);Alwin Carus and Leila Elliott (center) who heard Maud Powell play in Peru in the 1910s; Kay Wildman and Elizabeth Reed Smith. The idea of honoring Peru's most famous citizen with a statue was first conceived by Mayor Donald Baker in conjunction with the Downtown Peru Redevelopment Project. 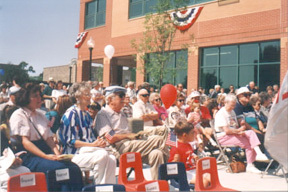 With the support of Peru's City Council, William R. Schulte chaired the Peru Statue Committee which raised funds for the memorial and organized the festive dedication ceremonies. Willa Jean Dellinger created additional community interest in Maud Powell with her numerous presentations in Peru's public schools introducing young people to Maud Powell and telling them of her particular significance to Peru. 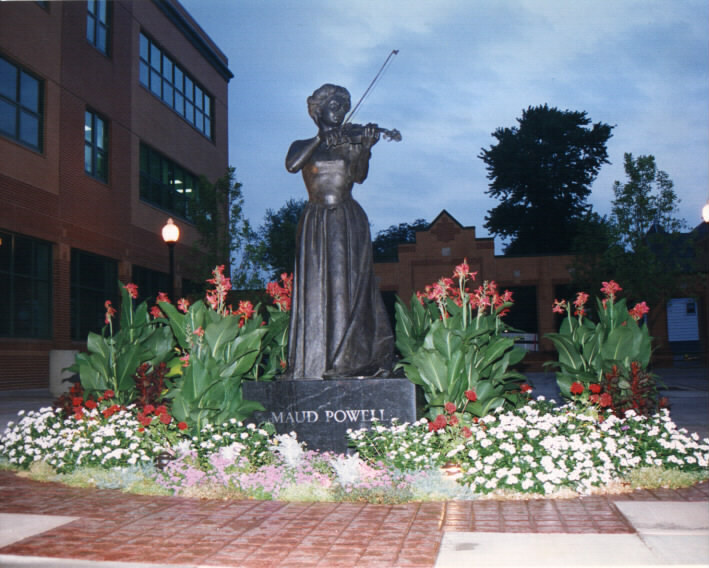 Through the initiative of Maud Powell Society board member and retired school teacher Willa Jean Dellinger, the city of Peru began celebrating Maud Powell's birthday (August 22) in August each year after the statue was dedicated. 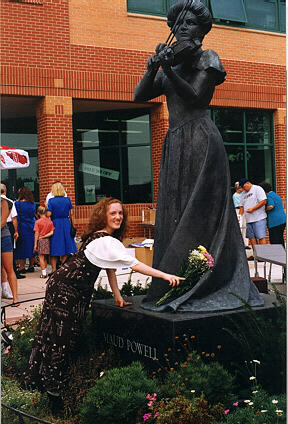 The Maud Powell Arts Celebration features concerts and art exhibits by local musicians and artists and in 1998 and 2002 violinist Rachel Barton Pine performed a recital tribute to Maud Powell. 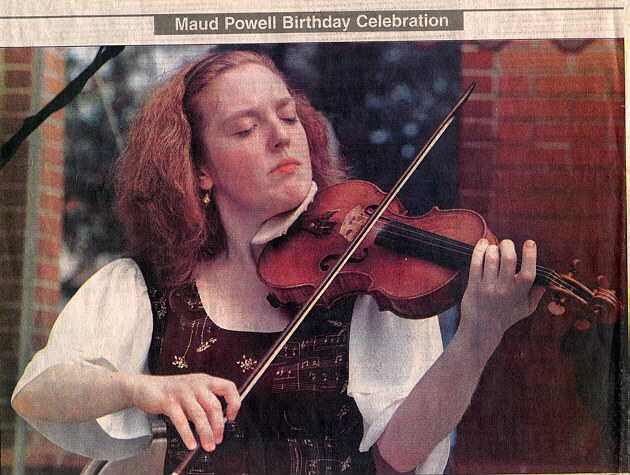 The annual event continues to honor Maud Powell on her birthday. For the schedule of this year's events, click here. 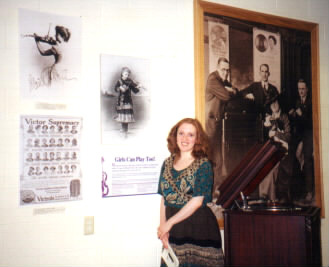 The Peru Public Library hosted the Exhibit: Maud Powell , Pioneer American Violinist from 1996-2001. 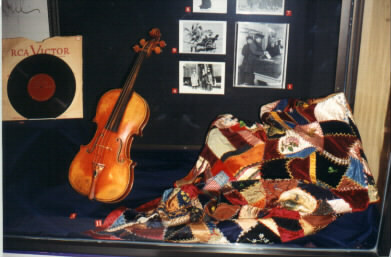 The exhibit featured the Nicholas R. Brewer oil portrait of Maud Powell, along with a plaster cast of Powell's right hand, the crazy quilt made by Maud's mother from her concert gowns, and numerous original letters, programs, and photographs. The American portrait and landscape artist Nicholas R. Brewer painted Maud Powell's portrait in Chicago in the spring of 1918 during one of Powell's many visits to that city. She is seen holding her Guadagnini violin in the picture. Brewer described Maud Powell during the sittings: "With a temperament innately artistic, her sympathetic grasp of my requirements and her delightful conversation rendered the sittings a pleasure and the work a success. At every rest interval she seized her violin and played." Brewer gave the portrait to the Montgomery (Alabama) Museum of Fine Arts. It was discovered there and sold to the Maud Powell Society in 1994. 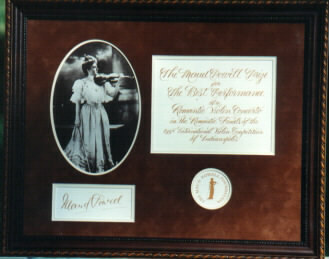 The painting was displayed as the visual centerpiece of the 1994 Indianapolis International Violin Competition as part of the Maud Powell exhibit at the Indianapolis Children's Museum. 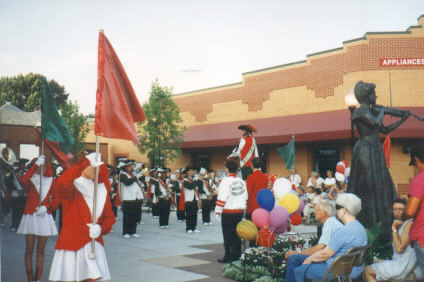 From 1996 through 2001, it was exhibited at the Peru Public Library. Recognizing Powell's national significance and Brewer's artistry, the portrait was accepted by the trustees of the Smithsonian Institution's National Portrait Gallery in Washington, D.C. in January 2002. 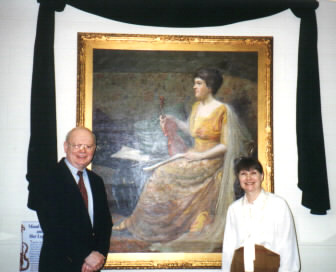 The portrait was the gift of Joyce McFarland Dlugopolski in memory of George A. Doole, Jr. and of The Maud Powell Society for Music and Education. We advise you to make an appointment with the National Portrait Gallery to view it since it is displayed on a rotating basis. 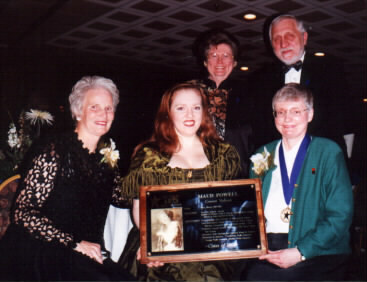 Maud Powell was inducted into the Fox Valley Arts Hall of Fame on April 4, 2002, in recognition of her extraordinary achievement in the arts. Maud Powell, who grew up in Aurora, Illinois, was included in the first class of inductees. Representatives of the Maud Powell Society participated in the dinner celebration and Powell biographer Karen A. Shaffer accepted the award and beautiful gold medallion in Powell's behalf. 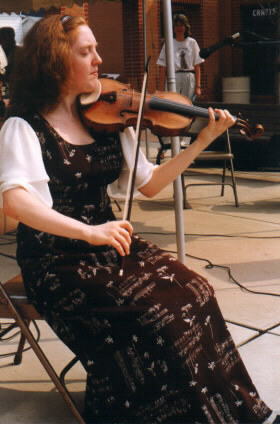 Violinist Rachel Barton Pine expressed appreciation for the award as Maud would have done by performing Powell's transcription of Deep River . The elegant Hall of Fame plaque honoring Maud Powell can be seen along with others at the Paramount Arts Centre in downtown Aurora. 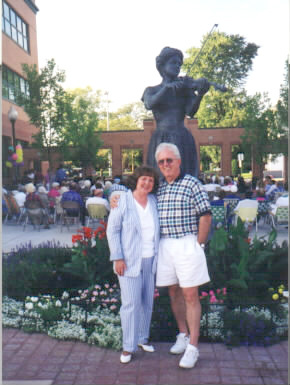 The Fox Valley Arts Hall of Fame, a committee of distinguished citizens chaired by Susan S. Starret, was founded in 2001 to give residents of Illinois' Fox Valley the opportunity to celebrate the contribution of local artists to the quality of life in the community, ensuring a strong cultural legacy for future generations. 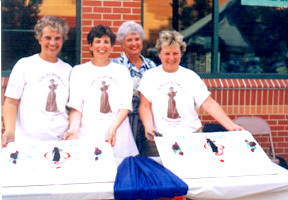 Visit their web site at www.foxvalleyarts.org . We invite musicians everywhere to dedicate concerto performances or give concerts commemorating the life and art of Maud Powell. 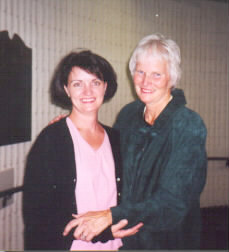 The following violinists have honored Maud Powell in various concerts: Elisabeth Adkins, Kelly Barr, Rachel Barton Pine www.rachelbartonpine.com, Mary Findley, Rhonda Frascotti, Jody Gatwood, Amy Beth Horman, Carolyn Lukancic, Yehudi Menuhin www.yehudimenuhin.com , Linda Plaut, Aaron Rosand www.aaronrosand.com , Joseph Silverstein, Elizabeth Reed Smith. "A Tribute to Maud Powell's American Spirit"